This week, positive data from a Kite Pharma CAR-T immunotherapy clinical trial was released showing that more than one-third of refractory aggressive non-Hodgkin lymphoma (NHL) patients in the study showed no signs of the disease after six months. Since 2015, The Leukemia & Lymphoma Society has been funding this study through its collaboration with Kite Pharma, a biotechnology company focused on immunotherapy. 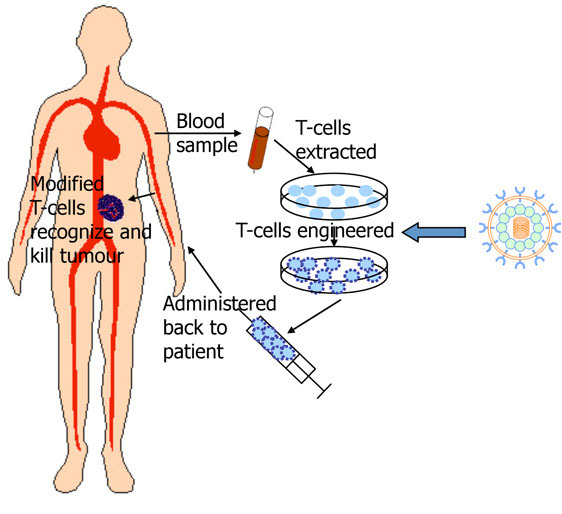 In this therapy, immune T-cells are removed from the patient’s body, and then the cells are genetically engineered to produce a protein on the surface of the T-cells that can bind and recognize the cancer cells. Once the T-cells “home in” on the cancer cells, this triggers the T-cells to multiply and kill the cancer-ridden cells. This clinical study is funded through LLS’s Therapy Acceleration Program (TAP)® through which LLS collaborates directly with biotechnology companies to help accelerate the development of promising therapies. LLS also supports Novartis’s CAR-T program, through support of a team led by Dr. Carl June of the University of Pennsylvania who is credited with pioneering this therapy. LLS has invested in the work of Dr. June and his colleagues since 1998, investing more than $20 million to advance this treatment. Because of this groundbreaking research, we have seen remarkable progress in the treatment of blood cancer. This therapy has proven to be miraculously effective in patients with certain types of leukemia and lymphoma. Dozens of adults and children near death are now in remission, and some remain healthy up to five years after treatment. While the U.S. Food and Drug Administration has not yet approved this treatment, patients are able to enroll in clinical trials. If you are a blood cancer patient or caregiver interested in enrolling in a clinical trial, you can contact our master’s level information specialists at the LLS Information Resource Center. Image used with permission from The Stiliyan Petrov Foundation (SPF) with reference to the Department of Hematology at the University College London, United Kingdom.